The vine rests when she is trained up the elm tree, a creeper seeking light and sky: in her incredible growth, filled with the energy of the Spring, she seeks the Gods and the Infinite. I know of no other plant that combines delicacy, vigor, strength and generosity in this manner. The Etruscans taught us how to grow the vine: "Put her near a tree," they said, as she needs strong masculine support to properly express herself." I have indelible memories of the taste of the grapes I would savor while perched on elm trees when I was a savage little girl in the lands of my parents, in Custoza and Valpolicella, near Verona. Quiescit Vitis in ulmo The vines live undisturbed on the elm, said the ancients, but in Tuscany now one rarely sees the old trees, which were usually walnuts, supporting three to four vines that were free to grow impetuously up their branches, reaching for the sky. 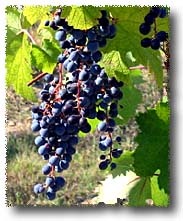 And the many bunches were rich in sugars because the vines had lots of soil and grew freely. 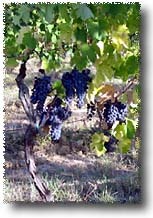 They were the classic Tuscan vines: Sangiovese, Canaiolo, Trebbiano, and Malvasia, which joined together to make Tuscany's famed red wine. Then came specialized vineyards, and new clones in Tuscany too, new varietals from beyond the Alps, and things changed quickly. Changes in taste, due in part to dietary restrictions, and in part to the new fashion that called for more extraction, softness, and ever more international flavors, make us forget what the varietals of the old Chianti, fermented in various ways, are capable of . The classic blend, with white grapes.